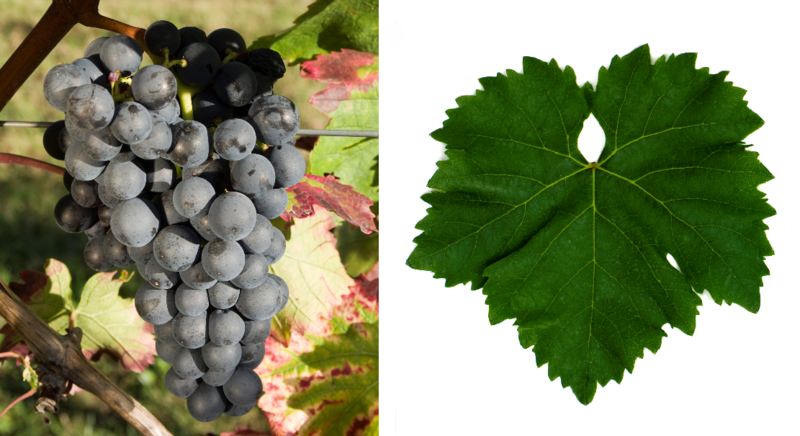 The red grape variety comes from Lower Styria (Austria-Hungary) in today's north-eastern Slovenia, although the name incorrectly indicates Portugal. There are over a hundred Synonyms; the most important alphabetically grouped by country are Autrichien, Portugais Bleu ( France ); Porthogese, Porthogese Nero, Porthogeze, Portoghese ( Italy ); Early Burgundy California ); Portugizac Crni ( Croatia ); Badner, Badener, Portugieser, Portugieser Blau, Vöslaner, Vöslauer ( Austria ); Português Azul ( Portugal ); Modrý Portugal, Portugalkja, Portugalské Modré ( Slovakia. Czech Republic ); Modra Portugalka, Portugal ( Slovenia ); Kékoportó ( Hungary ). The hypothesis of origin Portugal relies on a document in the community Gumpoldskirchen (NE). In this is stated that the Vöslauer castle baron of Fries 1772 the sort of postage to Bad Vöslau brought. The Ampelograph Hermann Goethe (1837-1911) also stated in 1887 the thesis that the Portuguese variety Moreto do Alentejo identical. Against the ancestry In any case, Portugal speaks that it is colored only in Austria game types of the variety and also many Austria-related synonyms. Finally, it was done in 2016 DNA analysis the parenting Blue room grape x Sylvaner determined. In this context, the origin from northeastern Slovenia was clarified. The early to mid-season, high-yielding vine is prone to Botrytis. Esca and both mildews, and especially for the Black spots disease, It produces a ruby ​​red, bright red wine with fresh acidity and hay flower aroma. These are usually intended for quick enjoyment. With reduced yield and Barrique Wines with storage potential are also possible. The variety is also called table grape suitable and also serves as basic wine for sparkling wines. The champagne pioneer Robert Schlumberger (1814-1879), incidentally, produced the first Austrian sparkling wine in Bad Vöslau (Lower Austria) in 1846 ( Blanc de noirs ). From Austria, the variety spread to other countries and came through the German wine-growing pioneer Johann Philipp Bronner (1792-1864) in 1840 also after Germany, Here it was in 2009 with 4,202 hectares, the third most common red vine. Above all, it is in the two growing areas palatinate and Rheinhessen common. A large part becomes Portuguese there Weißherbst processed. In Austria, it occupied in 2009 only 1,622 hectares of vineyards with a strong falling trend. In Hungary 2010 were thus mainly in the fields Villány and Kunság 1,216 hectares planted. Other stocks existed in 2010 Chile (2 ha), Croatia (42 ha), Slovakia (92 ha), Czech Republic (622 ha) and as Early Burgundy in California, The variety took in 2010 a total of 6,798 hectares of vineyards. That's in the worldwide varieties ranking the rank 94. This page was last modified at 16 November 2018 at 08:50.